The world is a strange place, with an almost unimaginable number of wondrous things to see. Unfortunately, when darkness falls, the world is difficult to see . . . and the dark is where the wondrous wilts, and the strangeness dwells most deadly. 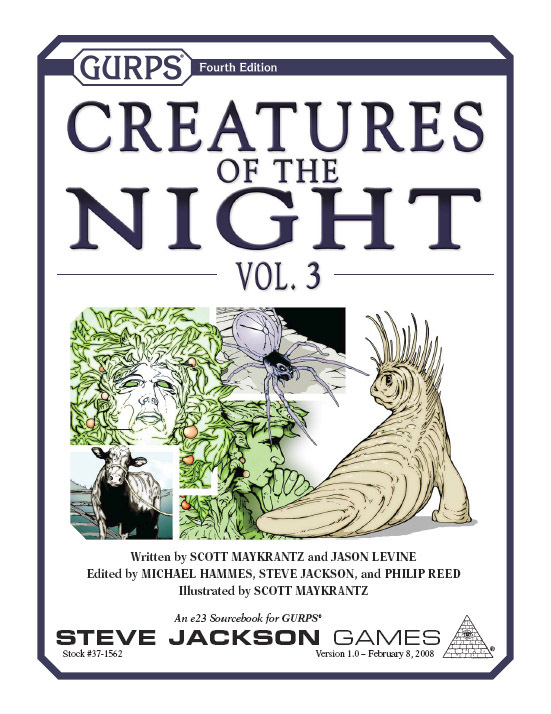 The Creatures of the Night line brings creepy crawlies of all varieties to your GURPS games. 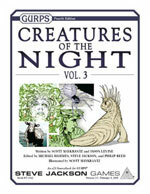 Each supplement contains several oddities, designed for use with a variety of campaigns and genres. Each entry is fully detailed with a description of the oddity, information about where it can be found, its modus operandi, game stats, and adventure ideas. Each also contains information about what sort of skills or abilities adventurers require to overcome the threat, as well as ideas for how to incorporate it into one-shot use or ongoing campaigns.